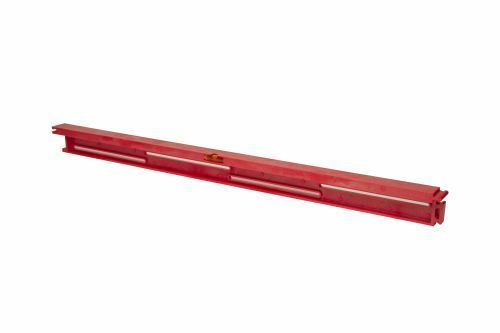 This is the 27" long red plastic section for straight walls. Designed primarily for shower wall tile installations, the Stringa-Level Tile Support System is for use on any wall mounted tile installation where tiling begins above the floor. The system is a set of reusable tools that eliminate time wasting straightness and level problems with wood stringers. The system is comprised of interlocking sections with level vials that are used in series to form a continuous angle support shelf on which the first course of tile rests. The sections are temporarily attached to the wall with user supplied screws and washers through multiple slots in each section. Available in kit and component form with illustrated usage instructions. No. SL-2700-RS Stringa-Level Rigid Section - This 27" long section is for straight walls and has a single level vial in the center. It can be attached to another Rigid Section, or a Flexible Section, and has four slots for attaching to the wall. Molded of red plastic and is 26-7/8" long x 1-1/4" wide x 2" high.